Objective The outcome of participants with nephrotic syndrome in clinical trials of lupus nephritis has not been studied in detail. Methods Collated data from two randomised controlled trials in lupus nephritis, Lupus Nephritis Assessment of Rituximab (LUNAR) and A Study to Evaluate Ocrelizumab in Patients With Nephritis due to Systemic Lupus Erythematosus (BELONG) were analysed. Nephrotic syndrome was defined as albumin <3 g/dL and urine protein/creatinine ratio ≥3.5 g/g at start of trial. Renal response was defined as a first morning urine protein/creatinine ratio ≤0.5 g/g in addition to ≤25% increase in creatinine from trial entry assessed at week 48. Logistic regression was used to evaluate the association of nephrotic syndrome with renal response while adjusting for treatment received and ACE inhibitor or angiotensin receptor blocker use. Results 28 (26%) participants with nephrotic syndrome achieved renal response as compared with 130 (52.5%) of those without (p<0.001). Having nephrotic syndrome at baseline significantly lowered the likelihood of achieving renal response (OR 0.32, 95 % CI 0.19 to 0.54, p<0.001). 125 (80%) participants achieved resolution of their nephrotic syndrome in a median time of 16 weeks. Conclusions Nephrotic syndrome at baseline decreases the likelihood of renal response at 1 year. Longer clinical trials or better short-term predictors of long-term outcomes may better assess the effect of novel therapeutic approaches on subjects with nephrotic syndrome. Prospective cohorts have shown that subjects with lupus nephritis and elevated baseline proteinuria (greater than 2– 3.5 g/day) have a lower probability of achieving renal response within a year. Nonetheless, many achieve renal response after 1 year.17 27 28 Subjects with elevated proteinuria, such as those with nephrotic syndrome, may require more time to reach a specific urine protein threshold; therefore, longer trials may better assess the effect of novel therapeutic approaches in this subgroup. Additionally, reductions in proteinuria of >50% in the first 6 months of treatment have also been associated with good long-term outcomes in lupus nephritis16 29 and may be a better long-term prognostic indicator than 1 year proteinuria levels in those with baseline nephrotic syndrome, although this has not been validated in prospective cohorts. The combined BELONG and LUNAR trials comprised 525 participants. The LUNAR trial (clinicaltrials.gov identifier NCT00282347)30 randomised 144 participants to rituximab (n=72) or placebo (n=72) from January 2006 to January 2008. The BELONG trial (clinicaltrials.gov identifier NCT00626197)31 randomised 381 participants to 1000 mg ocrelizumab (n=128), 400 mg ocrelizumab (n=127) or placebo (N=126) from February 2008 to October 2009. For both trials, participants were required to fulfil the American College of Rheumatology criteria for SLE as well as have renal biopsy showing Class III±V or Class IV±V. In the LUNAR trial, participants received either placebo or 1 g of rituximab on days 1, 15, 168 and 182. Mycophenolate mofetil (MMF) was maintained at 3 g/day. Three grams of methylprednisolone were given by day 3. Oral steroids starting at 0.75 mg/kg/day were tapered to 10 mg/day by week 16. The primary endpoint was assessed at week 52. In the BELONG trial, participants received placebo, 400 mg ocrelizumab or 1000 mg ocrelizumab on days 1 and 15, at week 16 and every 16 weeks thereafter. Two hundred and thirty-nine participants (63%) in BELONG trial were maintained on MMF at 3 g/day, while 142 participants (37%) received cyclophosphamide according to the ELNT regimen32 followed by azathioprine 2 mg/kg/day. Three grams of methylprednisolone were given by day 15. Oral steroids starting at 0.5–0.75 mg/kg/day were tapered to 10 mg/day by week 10. The primary endpoint was assessed at week 48. The BELONG trial was terminated early due to a benefit/risk assessment that did not support the continued development of ocrelizumab for lupus nephritis. Importantly, rituximab and ocrelizumab are not approved for use in lupus nephritis. First visit urine protein/creatinine ratio (UPCR) was obtained from a 24-hour urine collection. For all subsequent visits, UPCRs were obtained from first morning urine spot samples. Nephrotic syndrome was defined as UPCR ≥3.5 g/g and serum albumin <3 g/dL at start of trial. Resolution of nephrotic syndrome was defined as UPCR <3.5 and albumin ≥3 g/dL. The average daily steroid dose and average daily MMF dose were calculated only in participants who completed 48 weeks in the trials (n=356). For the average daily steroid dose, only the steroid taper was considered. Pulse steroids or premedication doses were not used in this calculation. Normal C3 was considered to be ≥90 mg/dL and a negative anti-dsDNA antibody was considered to be ≤30 IU/mL. Starting an ACE inhibitor or an angiotensin receptor blocker (ARB) at screening was required in LUNAR trial and recommended in BELONG trial. Continuation of ACE/ARB was encouraged in both trials but was left at the discretion of the principal investigator. For these analyses, ACE/ARB use was considered positive if participants received it for a period of at least 3 months. BELONG renal response criteria included a UPCR ≤0.5 g/g in addition to ≤25% increase in creatinine from trial entry, assessed at week 48. LUNAR renal response criteria included UPCR ≤0.5 g/g in addition to ≤15% increase in creatinine from trial entry and inactive urinary sediment (<5 red blood cells (RBC) per high-power field and the absence of RBC casts) assessed at week 52. In order to combine data from both trials, BELONG’s definition of renal response was used and assessed at week 48. An additional endpoint explored was time to resolution of nephrotic syndrome in weeks. Differences in baseline characteristics were assessed by Student’s t-test, χ2 test or Mann-Whitney U test as appropriate. Logistic regression was used to assess the relationship between nephrotic syndrome and binary outcomes, and linear regression was used to assess the relationship between nephrotic syndrome and continuous outcomes. Regressions were adjusted for treatment received and ACE/ARB use. Kaplan-Meier survival analyses were used to analyse time to events. HRs were used to compare likelihood of event occurrences. The screening value for UPCR and albumin was imputed for four participants with missing day 1 values. Week 52 values were imputed for 10 participants from the LUNAR trial with missing week 48 values. Analyses were performed using STATA V.14.2 software. A two-sided p value of <0.05 was considered statistically significant. Five hundred and twenty-two subjects had complete baseline information. One hundred and fifty-seven (30%) subjects had baseline nephrotic syndrome. Subjects with nephrotic syndrome had higher levels of UPCR (6.7 vs 2.2 g/g, p<0.001), total cholesterol (306 vs 237 mg/dL, p<0.001), low-density lipoprotein (191 vs 141 mg/dL, p<0.001) and triglycerides (225 vs 161 mg/dL, p<0.001), as well as higher diastolic (83 vs 78 mm Hg, p<0.001) and systolic (130 vs 124 mm Hg, p<0.001) blood pressure. They also had lower estimated glomerular filtration rate (eGFR) (73 vs 91 mL/min, p<0.001), as well as lower levels of serum albumin (2.3 vs 3.3 g/dL, p<0.001), immunoglobulin G (7.9 vs 10.9 g/dL, p<0.001) and C3 (60 vs 65 mg/dL, p=0.02). There was a greater proportion of biopsies with mixed Class III/V and IV/V in those with nephrotic syndrome as compared with those without (30.5% vs 19%, p=0.004) (table 1). Due to the early termination of BELONG trial and other reasons for early withdrawal, 356 (68%) participants had UPCR and creatinine values up to week 48. Of these, 28 (26%) with baseline nephrotic syndrome achieved renal response, as compared with 130 (52.5%) of those without (p<0.001). Having nephrotic syndrome at baseline associated with a lower likelihood of achieving renal response adjusting for treatment received and ACE/ARB use: OR 0.32, 95% CI 0.19 to 0.54, p<0.001. A sensitivity analysis using the original response criteria for each trial showed quantitatively similar results (adjusted OR 0.38, 95% CI 0.22 to 0.64, p<0.001). Those with baseline nephrotic syndrome had on average a 2.9 g/g (95% CI −3.4, to 2.4, p<0.001) greater drop in proteinuria at week 24 and 3.3 g/g (95% CI −3.9, to 2.7, p<0.001) greater drop in proteinuria at week 48 compared with non-nephrotic subjects (figure 1a). A greater percentage of subjects with nephrotic syndrome achieved 50% decrease in proteinuria at week 24 (71% vs 61%, p=0.04) and week 48 (80% vs 70%, p=0.05) as compared with non-nephrotic subjects. Evaluating subjects from the LUNAR trial with data up to week 78, the lowest mean UPCR for subjects with nephrotic syndrome (n=48) was achieved at week 64 (1.2 g/g), whereas for those without nephrotic syndrome (n=72) it was achieved at week 52 (0.78 g/g) (figure 1b). (A) Mean urine protein/creatinine ratio (UPCR) and SEM in participants from the combined Lupus Nephritis Assessment of Rituximab (LUNAR) and A Study to Evaluate Ocrelizumab in Patients With Nephritis due to Systemic Lupus Erythematosus trials with complete UPCR information up to week 48, comparing those with baseline nephrotic syndrome (n=108) versus those without (n=248). (B) Mean UPCR and SEM in participants from the LUNAR trial with complete UPCR information up to week 78, comparing those with baseline nephrotic syndrome (n=48) versus those without (n=72). The HR (adjusted for treatment received) of normalisation of C3 in subjects with nephrotic syndrome was 1.08 relative to non-nephrotic subjects (95% CI 0.8 to 1.3, p=0.4). The HR (adjusted for treatment received) of anti-dsDNA antibody becoming negative in subjects with nephrotic syndrome was 1.5 relative to non-nephrotic subjects (95% CI 1.18 to 1.96, p=0.001). Subjects with nephrotic syndrome did not receive a significantly greater average daily steroid dose than non-nephrotic subjects when analysed within individual trials: LUNAR (18 vs 18 mg, p=0.9) and BELONG (15.5 vs 14 mg, p=0.4). Subjects with nephrotic syndrome also did not receive a significantly greater average daily MMF dose (2.5 vs 2.5, p=0.9). One hundred and fifty-seven subjects with nephrotic syndrome at baseline were analysed. One hundred and twenty-five (80%) subjects achieved resolution of nephrotic syndrome in a median time of 16 weeks (range 4–48, figure 2). Thirty-two subjects were censored prior to resolution of nephrotic syndrome including 13 subjects that were followed up to week 48. Reasons for censoring included early trial withdrawal, early termination of BELONG trial and reaching end of study period (week 48). Time to resolution of nephrotic syndrome by treatment arm was quite varied. 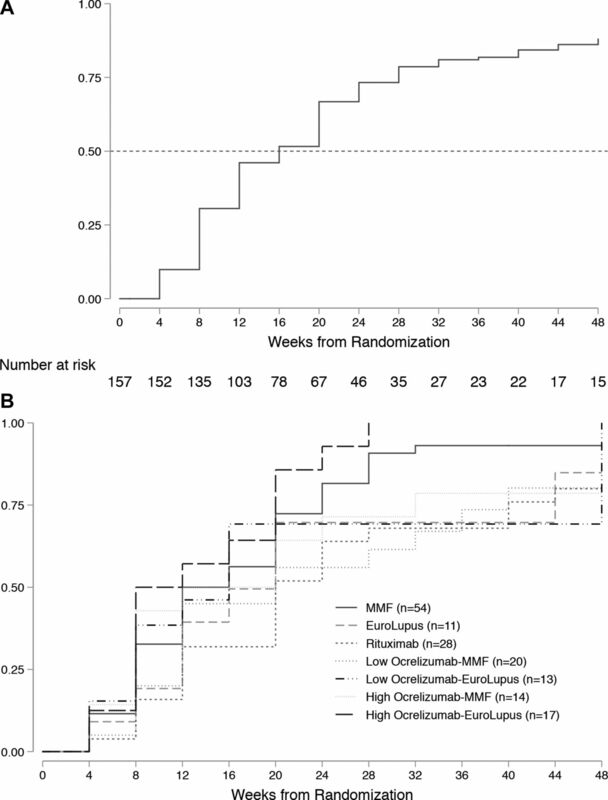 The HR (adjusted for ACE/ARB use) of resolution of nephrotic syndrome in those treated with rituximab+MMF was 0.6 relative to MMF+placebo (95% CI 0.34 to 1.0, p=0.05). The HR (adjusted for ACE/ARB use) of resolution of nephrotic syndrome in those treated with any anti-CD20 therapy was 0.79 relative to any placebo therapy (95% CI 0.55 to 1.14, p=0.2). (A and B) Kaplan-Meier curve depicting time to resolution of nephrotic syndrome in weeks by treatment received (n=157). Line depicts 50% of participants have achieved resolution of nephrotic syndrome. One hundred and eight subjects (of 157) with baseline nephrotic syndrome had UPCR and creatinine values up to week 48. Twenty-eight participants (26%) achieved renal response. Those who achieved response had lower baseline UPCR (5.6 vs 6.9, p=0.02) but baseline albumin was similar (2.3 vs 2.2, p=0.1) (table 2). Participants who achieved response also had a trend in greater decrease in proteinuria at week 24 (−4.9 vs −3.8 g/g, p=0.1) and week 48 (−5.5 vs −4.3 g/g, p=0.1) as well as a greater increase in albumin at week 48 (1.6 vs 1.3, p=0.06). Responders had greater decreases in systolic (−24 vs −13 mm Hg, p=0.02) and diastolic (−13 vs −6 mm Hg, p=0.04) blood pressure. 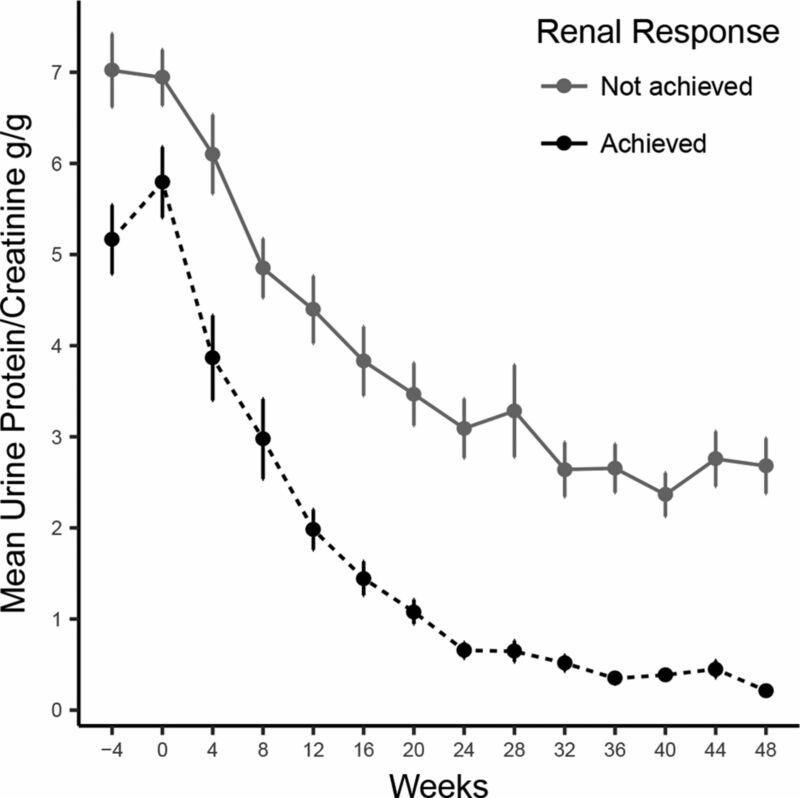 All subjects that achieved renal response had greater than 50% reduction in proteinuria at week 24. When analysed by trial, responders were treated with a similar average daily steroid dose in LUNAR (17.5 vs 18.5 mg, p=0.8) trial and a lower average daily steroid dose in BELONG (12 vs 16 mg, p=0.01) trial (figure 3). Mean urine protein/creatinine ratio (UPCR) and SEM of participants from the combined Lupus Nephritis Assessment of Rituximab and A Study to Evaluate Ocrelizumab in Patients With Nephritis due to Systemic Lupus Erythematosus trials with baseline nephrotic syndrome and complete UPCR information up to week 48, comparing responders (n=28) versus non-responders (n=80). Nephrotic syndrome, as initial disease presentation or as a disease flare, has important prognostic implications for treatment outcomes in lupus nephritis. Using collated data from the LUNAR and BELONG trials, we have shown that subjects with baseline nephrotic syndrome have a lower likelihood of achieving renal response in the course of 48 weeks of observation as compared with those without nephrotic syndrome. Similarly, observational studies15 33 have found a lower proportion of renal response in participants with nephrotic syndrome at 1 year. Despite the unique challenges that participants with nephrotic syndrome face, no major lupus nephritis trial has analysed the outcomes of these participants as a distinct subgroup. In spite of this difference in outcomes, the majority of participants with nephrotic syndrome in LUNAR and BELONG demonstrated clinically important improvements during their time in the trials. They had substantially larger decreases in proteinuria compared with non-nephrotic subjects, greater probability of achieving a negative anti-dsDNA antibody, as well as equal probability of normalising C3. In addition, a majority of participants achieved resolution of their nephrotic syndrome. The difference in outcomes between participants with nephrotic syndrome and those without could be due to the former having higher levels of renal disease activity at baseline as evidenced by their lower baseline eGFRs and C3 levels. Siu et al 15 similarly found that participants with nephrotic syndrome had higher creatinine and lower C3 levels at baseline. Low albumin has been correlated with higher disease activity in both subjects with lupus nephritis and subjects with extrarenal lupus.34 Additionally, low serum albumin increases creatinine tubular secretion35 36; therefore, eGFR calculations overestimate true GFR in subjects with nephrotic syndrome. It is likely this subgroup of participants had more severe renal disease than was apparent by the use of routine eGFR calculations. Furthermore, nephrotic syndrome participants had an increased proportion of mixed histology, III/V or IV/V, indicating more complex pathology which might respond more slowly and less completely than Class III or IV without membranous lesions. In spite of the fact that subjects with nephrotic syndrome may have more severe or complex disease, they had a greater probability of achieving a negative anti-dsDNA antibody than those who were non-nephrotic. This could be due to the specific type of anti-dsDNA that is associated with nephrotic syndrome, as it could be of a less pathogenic variant and thus more easily treatable.37 However, this finding could also be an indication that subjects with nephrotic syndrome have modifiable disease even if this is not apparent by absolute proteinuria and creatinine thresholds. The difference in outcomes could also be due to nephrotic syndrome affecting pharmacokinetics. Subjects with nephrotic syndrome have increased rituximab clearance,38 39 likely due to elevated levels of rituximab in their urine.40 41 This could have an impact in medication efficacy as evidenced by recent data from the LUNAR trial which has shown that subjects with nephrotic syndrome are less likely to achieve adequate B cell depletion after rituximab administration.42 Similar studies in subjects with nephrotic syndrome have not yet been performed for ocrelizumab. Notably, subjects with nephrotic syndrome were not treated with significantly higher average daily steroid doses or higher average daily MMF doses. Because MMF is highly bound to albumin, hypoalbuminaemia increases the concentration of the pharmacologically active metabolite.43 As with MMF, the pharmacologically active unbound fraction of prednisone is also increased in the setting of hypoalbuminaemia.44 These findings underscore the importance of taking nephrotic syndrome in consideration when evaluating new medications for lupus nephritis. Nephrotic syndrome is common in lupus nephritis, and altered pharmacokinetics could ultimately affect the efficacy of therapeutic interventions. Participants with nephrotic syndrome that achieved renal response had lower baseline UPCR compared with non-responders. However, similar to prior research28 overall decrease in proteinuria between groups was not significantly different, suggesting that a more prolonged observation time might have allowed more nephrotic participants to reach the 0.5 g/g proteinuria threshold. Subjects with nephrotic syndrome from LUNAR followed up to week 78 had their proteinuria nadir at week 64, whereas non-nephrotic participants had their proteinuria nadir at week 52. This finding provides support for the hypothesis that longer trials may better assess efficacy of novel therapeutic approaches in subjects with nephrotic syndrome. All nephrotic responders had greater than 50% reduction in proteinuria at week 24, supporting the hypothesis that reduction in proteinuria in the first 6 months of treatment could be a predictor of long-term renal outcomes for nephrotic syndrome participants. Despite the fact that the majority of participants with nephrotic syndrome did not achieve the endpoint of the trials, we do not advocate that they be excluded from future lupus nephritis trials. This would greatly limit our understanding of how these participants differ from those who are non-nephrotic as well as what therapies would work best for them. Instead, it may be prudent to prespecify baseline nephrotic syndrome as a subgroup for analysis and perhaps even as a stratification variable to ensure balance in the distribution of patients with nephrotic syndrome across treatment groups. In this way, rates of renal response in those with nephrotic syndrome as well as time to resolution of nephrotic syndrome could be directly compared across treatment arms. Additionally, better short-term predictors of long-term outcomes can be found and validated as endpoints, or trials that include participants with nephrotic syndrome can be designed to assess endpoints at 1.5 or 2 years. Limitations of this study include that this is a post hoc analysis of two randomised controlled trials. Our exposure of interest and our outcome are both based on proteinuria. Ideally, an outcome that is not based on proteinuria such as repeat renal biopsy would be used; however, repeat biopsies can be difficult to obtain in clinical trials and were not required for participation in LUNAR or BELONG. The duration of follow-up was limited to 48 weeks. In summary, subjects with baseline nephrotic syndrome had significantly lower likelihood of achieving renal response, as measured by creatinine and proteinuria, at 1 year. Nonetheless, they demonstrated clinically important improvements during the trials. In conclusion, longitudinal studies are necessary to better understand the overall prognosis of this subgroup of participants and to evaluate more adequate endpoints for use in future lupus nephritis trials. LUNAR and BELONG trials were sponsored by Genentech/Roche. Contributors LMGM, MDC, JG, and P.Brunetta, conceived the present idea. LMGM and MDC. analyzed the data. All authors participated in the interpretation of data, revised the manuscript critically and approved of the final version. Competing interests MDC, JG, TRK and PB are employees of Roche/Genentech. LMGM, PB, MD’E, DJ and BR have no disclosures. Ethics approval The LUNAR and BELONG study protocols were approved by institutional review boards and ethics committees and adhered to the Declaration of Helsinki. Participants provided written informed consent. Data sharing statement Qualified researchers may request access to individual patient level data through the clinical study data request platform (www.clinicalstudydatarequest.com). Further details on Roche's criteria for eligible studies are available here (https://clinicalstudydatarequest.com/Study-Sponsors/Study-Sponsors-Roche.aspx). For further details on Roche's Global Policy on the Sharing of Clinical Information and how to request access to related clinical study documents, see here (https://www.roche.com/research_and_development/who_we_are_how_we_work/clinical_trials/our_commitment_to_data_sharing.htm)”.